Palermo SoHo: El Salvador St. & Armenia St. 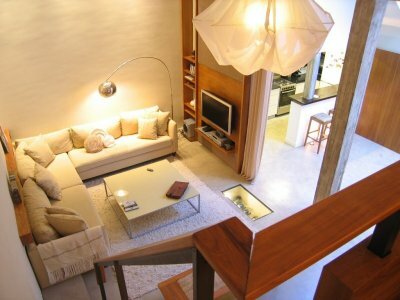 This unique house-like apartment (known as "PH") is located in the heart of Palermo SoHo. This area has become the trendiest area in town in the last years. You can find many beautiful bars, modern restaurants, bookstores, ateliers, furniture and clothes stores here. Every weekend a hippy market and an art fair take place on the main square “Plaza Serrano”. You will have easy access to public transportation. This original three bedroom home is distributed on three floors with the spacious living and dining area located on the ground floor and the bedrooms on the upper floor. 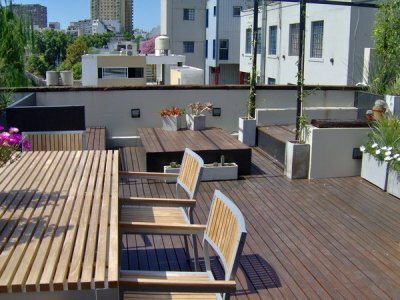 It provides all the amenities for a comfortable stay in the most trendiest area of Buenos Aires, such as a rooftop terrace of 42 mts2 (with barbecue, big dining table and beautiful sitting area), flatscreen TV, DVD player, and Wi-Fi internet access. - LIVING ROOM WITH DINING AREA: the spacious living room with its high walls and its stylish decoration offers a L-shaped sofa, coffeetable and a beautiful stool with a cover of finest Patagonian fish leather. A small wine cellar has been integrated into the floor. 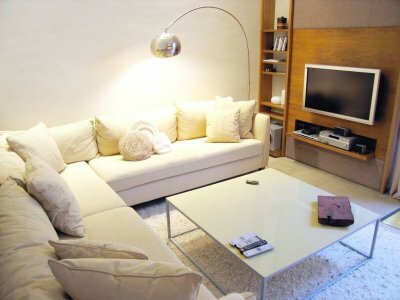 The flatscreen TV, DVD player and the home theatre make this the perfect area to enjoy a movie or listen to music. The dining area consists of a wooden table with six chairs. Air conditioning. 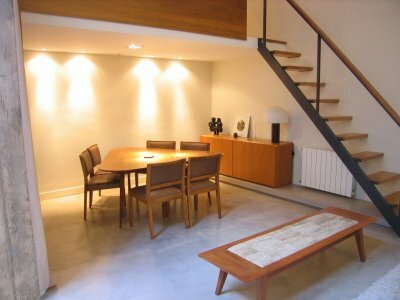 - OFFICE AREA: the office area is reached by a staircase from the living room. There is a writing desk available. High speed internet connection Wi-Fi. 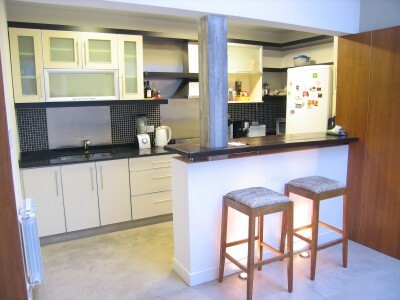 - KITCHEN: the kitchen area is separated from the rest of the living area by a bar with two high chairs. The modern equipment of the kitchen consists of a fridge with freezer, microwave, electric toaster, electric espressomaker, juicer, four-burner gas stove and oven. There is ample silverware, glasses, crockery and cooking utensils for entertaining up to eight people. 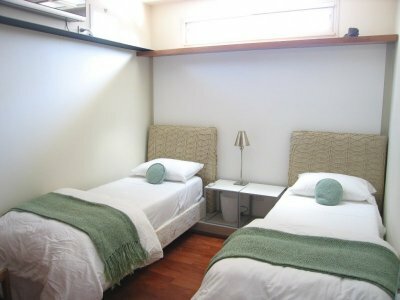 - LAUNDRY: the laundry area is located next to the kitchen perfectly hidden behind foldable doors. There is a washing machine as well as a dryer. - BATH: Modern style with shower. 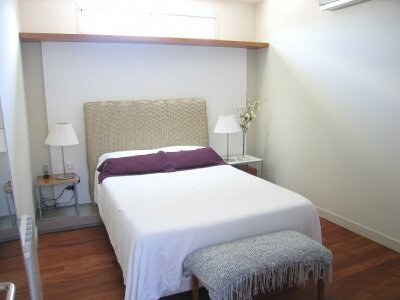 - MAIN BEDROOM: located on the first floor that can be reached by the staircase. Equipped with double bed (1.40x2.00 mts). Large walk-in closet, bed-side cabinets and lamps. Safe box. Air conditioning. - SECOND BEDROOM: also located on the second floor. With two twin beds (0.80x1.90 mts). Large closet, bed- side cabinets and lamps. Air conditioning. - MAIN BATHROOM: right next to the bedrooms with bathtub with shower. Hairdryer. 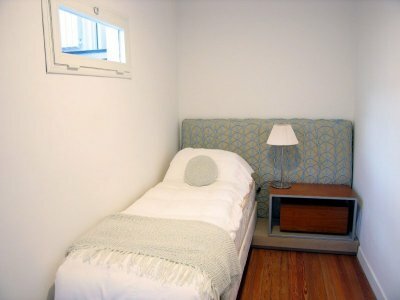 - THIRD BEDROOM: small room located midway between the first level and the second level. There is one twin-size bed (0.80 x1.90 mts.) in this extra room. 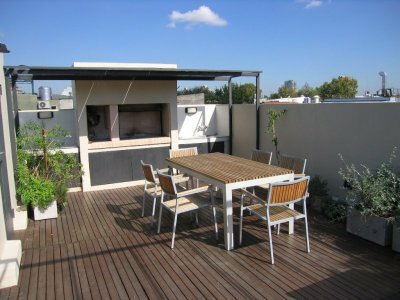 - PRIVATE ROOF-TOP TERRACE: the delightful terrace equipped with a big table with six chairs, a big sitting area and BBQ grill/Argentine "parrilla" so you can enjoy a great barbecue. The beautiful plants make this open air experience even more enjoyable. These rates are final in USD; they include: building expenses, local phone calls (control line for limited local calls), cable TV, High Speed Internet (Cable Modem & Wi-Fi), electricity, water, gas, cleaning service once a week and taxes. Please note: Rates from December 20th to January 5th are 20% higher for this apartment.